Standout Rock Fireplaces - Rustic & Casual! The casual and rustic stone or rock fireplaces featured in the web pages listed below include a wide variety of exciting looks -- many of which are created from river stone or fieldstone. From rugged Adirondack Great Camps and monumental Rocky Mountain lodges . . . . . . . to charming Craftsman country cottages and cozy lakeside log cabins . . . . . . you'll find an ideal stone hearth design for virtually any rustic or casual setting. So kick back and enjoy! Exceptional Designs By Ewing Architects! Rest & Relax In A Rustic Setting! Rock Out With Country Rock Fireplaces! Log In To Log Home Fireplaces! Country Rock Meets Rolling Stones! 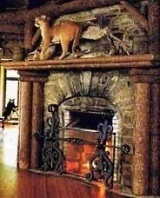 Extraordinary Stone Fireplace Hearth Designs! Unique Designs To Rock Your World!